Going in to the final weeks of the Online Slots Player Survey, early trends confirm what many would suspect about online slots players and also challenge some common assumptions. The Survey, presented by Slotland.com, asks players about their betting habits, memorable wins and strategies for winning. With mobile gambling becoming so popular, it also includes questions about playing games on mobile phones. Players that complete the Survey can enter a free contest. 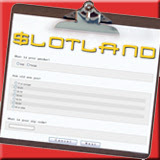 One player, drawn randomly, will win a $500 credit to their Slotland.com account. One thing the survey’s early results suggest is that most slots players aren’t just playing for pennies. Although most said the highest they ever bet was $50 - $100 most respondents so far also said they occasionally or almost always like to place a maximum bet. Most said their biggest win ever was $1000. There has been nearly unanimous agreement on how to win at slots: stick with a machine that feels lucky, no matter how tempting it is to switch games. Results so far show that video poker and solitaire are also popular with slots players while poker is not. Although some said they played the hugely popular online casino game occasionally, most didn’t play it much or at all. Slotland’s Online Slots Survey challenges one popular myth about slots players. Slots are enjoyed by people of all ages, not just seniors as many might think. While survey respondents have ranged from their 20s to their 60s and older, most have been in their 30s. Anyone online slots player can take the Online Slots Survey and get a chance to win $500. The Survey will remain online until Sunday, 23rd September at www.GamblingDaily.com/slots-survey.